PM Netanyahu tells visiting U.S. VP that recent comments by PA Chairman were proof that he does not want peace. Prime Minister Binyamin Netanyahu told visiting U.S. Vice President Joe Biden on Monday that recent comments by Palestinian Authority (PA) Chairman Mahmoud Abbas were proof that he does not want peace. According to Kol Yisrael radio, Netanyahu made the comments during his dinner meeting with Biden at the Prime Minister’s Residence on Monday night. Netanyahu reportedly complained to Biden about Abbas’s comments on Saturday, in which he said that there will be no peace with Israel unless all his preconditions are met. These comments, Netanyahu told Biden, were proof that Abbas is not prepared to make the necessary decisions that would bring about peace. Abbas told a delegation on Saturday that there will be "no peace between us and Israel" without eastern Jerusalem as the capital of the future Palestinian state. Abbas added that he heard that the Israelis had refused to mention Jerusalem in any talks or negotiations. "Let them say whatever they say. Unless it is mentioned clearly and marked in big fonts that it is the capital of the state of Palestine, there will be no peace with them and I want them to hear this," he declared. "Our language is understandable. We have been hearing lots of talks about the capital here and there. The capital is Jerusalem and its surroundings in Jerusalem which were occupied in 1967," he said, highlighting that he is adhering to a stance that has long been official policy. "We have a right even though we are weak in the world. We will continue to demand our rights and we will realize them," said Abbas. The comments are nothing new, as the PA Chairman has repeatedly stressed that unless all his demands are met, there will be no peace with Israel. Netanyahu’s meeting with Biden on Monday came after Biden with President Shimon Peres. During that meeting, Biden called on Israel to “seize the moment” and reach an agreement with the PA.
"The one place (in the region) where there's a possibility for an island of stability ... is between the Palestinian people and the Israeli people, in two secure states respecting one another's sovereignty and security," Biden told Peres. "And the president believes and I believe that this is one of those opportunities, one of those moments in history where it has to be seized," he added. 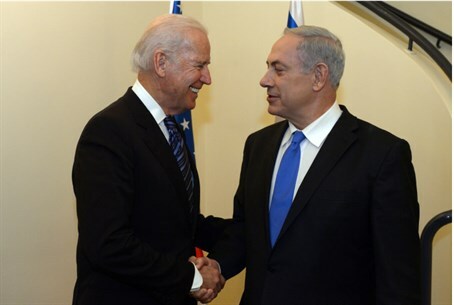 Biden admitted there were some "very difficult decisions" ahead, but expressed confidence that Netanyahu was "up to" the task and expressed hope that the same was true of Abbas.